While foil-packet cooking is most often done during camping, it's also a convenient way to cook lean cuts of steak in the oven. Wrapped in foil, the steak essentially cooks in its own steam, ensuring that moisture stays in the meat. You can also turn it into a single-serve meal by adding vegetables to steam cook in the packet along with the steak. Preheat your oven to 350 degrees Fahrenheit. Cut a sheet of aluminum foil large enough to completely cover your steak, with room to spare. Brush your steak with olive oil, then season with salt and pepper on both sides to your taste. Place the steak in the center of the aluminum foil sheet. Add sliced or chopped uncooked vegetables on top of the steak as an optional addition. Drizzle olive oil or a few pats of butter on the vegetables. Moisture-rich vegetables are ideal, such as bell peppers, onions and zucchini. Potatoes and carrots take longer to cook and should be diced into small pieces to help them cook a little faster. 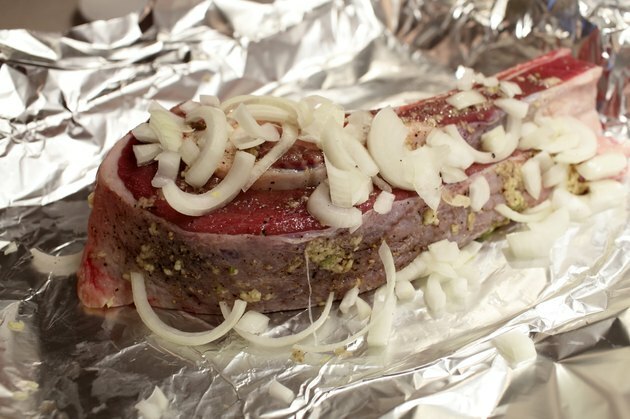 Seal the foil around the food by bringing the ends together over the steak and folding the excess over. There should be a little extra room in the packet to allow for steaming. Place the foil packet in the preheated oven and bake until the steak is cooked to a minimum temperature of 145 F and the vegetables are tender. Use a meat thermometer to determine the steak's proper temperature. Be mindful of the steam escaping each time you open the packet to check for doneness. Dice hard vegetables like potatoes and carrots into small, equal sizes to ensure even cooking and to help the potatoes cook at relatively the same rate as the steak. FoodSafety.gov recommends beef be cooked to a minimum temperature of 145 F for safe consumption, which will bring your steak to roughly a medium temperature.